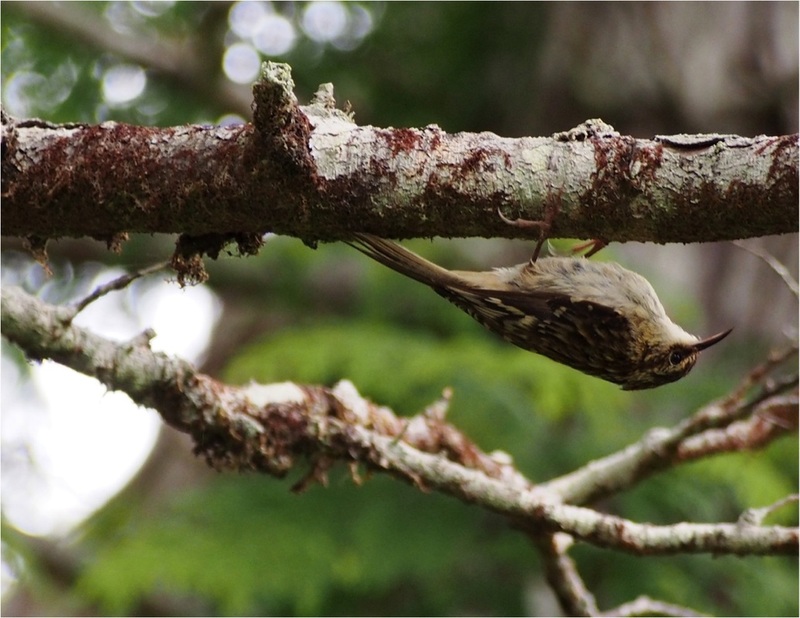 Left and top right: brown creepers blending in with tree bark; photos by Mike Yip (left) and Misha Warbanski. 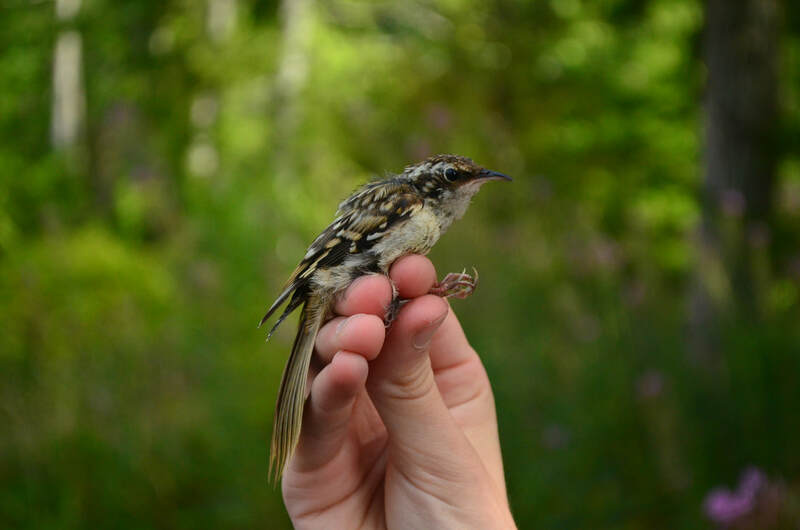 Bottom right: a brown creeper photographed by Kim Wetten with the VIU Bird Banding Project. The brown creeper is a small, slender bird with a long tail and a curved, slender bill. Its plumage is streaked brown and white, blending into the bark of trees and making it hard to spot. Its belly is white, and it has a light eyebrow. This species tends to nest in mixed or coniferous forests, where it hitches along the bark of large trees, following spiralling paths around trunks and branches in search of insects and spiders. The brown creeper is found across much of the United States and southern Canada, though on the Pacific Coast its range extends as far north as the Gulf of Alaska. The brown creeper has a specialized anatomy which prevents downward movement on trees; instead it flies to a lower spot on a different tree and begin its ascent again. This species nests in old trees with loose bark, building a hammock-like nest from twigs, bark, insect cocoons and spider egg cases, among other materials. Its preference for old trees makes it vulnerable to habitat degradation and fragmentation from logging. 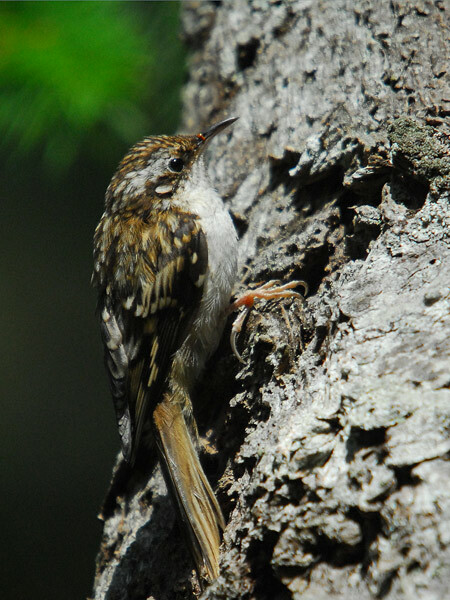 Brown creeper numbers have declined in the Douglas-fir forests of the Pacific Northwest. Brown Creeper. Certhia americana. The Birds of North America Online (A. Poole, Ed.). Ithaca: Cornell Lab of Ornithology; Retrieved from the Birds of North America Online. Accessed 19/02/2013. Dunn, J. L. and Alderfer, J. (Eds.). (2006). National Geographic Field Guide to the Birds of North America. (5th Ed.). Washington, D.C.: National Geographic Society. Pp. 340-341. Hejl, S. J., K. R. Newlon, M. E. Mcfadzen, J. S. Young and C. K. Ghalambor. (2002). Brown Creeper (Certhia americana), The Birds of North America Online (A. Poole, Ed.). Ithaca: Cornell Lab of Ornithology; Retrieved from the Birds of North America Online. Accessed 17/03/2013.